I love having crazy creative friends. The following audio found its way to my voicemail a few weeks ago. Check out this interesting Wall Street Journal take on the slight return to improvisation in classical music. Especially dig the last sentence of the first paragraph I quote below. “Violinist and composer Mark O’Connor, who improvised a two-minute solo passage while performing one of his own compositions at Carnegie Hall last month, says performers have to relearn how to be creative, in part because their training places so much emphasis on the flawless execution of another person’s creation. ‘One of the reasons we don’t see more improvisation in the academic setting is because at some point in our education system, the creative composers were separated from the virtuosic performers. Some of that is starting to be broken down now,’ says Mr. O’Connor, who learned to improvise by studying jazz and folk music and now coaches young musicians in improvisation at UCLA, Harvard and the Curtis Institute of Music in Philadelphia. Being back in school at the moment, and surrounded by academic approaches to music, it really hits home for me that we spend too much time categorizing music, and not enough time embracing and exploring it all. We all knew it would happen, but I didn’t know it would be today. The NYT article linked above takes an interesting look at the titling of pieces. I can’t say that I agree with all of it, but it is thought provoking. Kozinn seems shocked that Penderecki’s “Threnody for the Victims of Hiroshima” was titled after the fact and not composed with the intent of making that statement. Does that make the statement less effective? I tend to fall into the camp that believes that the listener/experiencer provides his own meaning. After we write/play the music, and give it a title, it is out of our hands. The listener will make of it whatever she likes. As long as the music moves the listener in some way, I feel like I have accomplished what I set out to do. If a title makes that process of discovering personal meaning more fun or mysterious or confounding, then that is even better. I grew up in Lafayette, LA. I was never a big cajun music fan, but it was definitely in the air in my childhood. There are a few people that I remember as being the really big deals of cajun music. Michael Doucet and Beausoleil and Zachary Richard were at the top of that list. Zachary Richard has lived in other parts of the world at points in time, but Michael Doucet seemed to always be around. I’d see him in the airport in Lafayette or New Orleans, and Beausoleil played pretty regularly in town in my youth. Lafayette has produced more than its fair share of good trombonists largely through the influence of Robert Schmalz who taught trombone and music history at USL through the 80’s and 90’s. A number of his students have gone on to become fairly well known trombonists. He was my teacher in high school. Lafayette hasn’t produced many free jazz artists. Dickie Landry comes to mind, but the pool isn’t too deep after that. I imagine that when it comes to free jazz trombonists from Lafayette, I may be the lone member of that club. Imagine my surprise when this popped up on my eMusic screen today. The lines at my polling place were fairly long at 10 am. 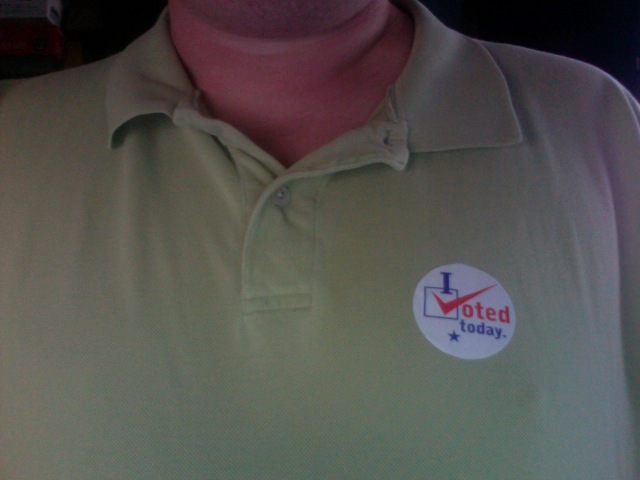 It took about 45 minutes to get through the line and cast my ballot. I brought my 7 year old daughter along. Fortunately I had just downloaded a bowling game to my phone, and that kept us occupied while we waited. Have you gotten your “I voted today” sticker yet? 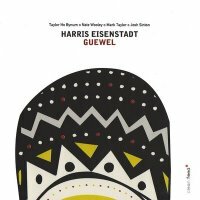 I recently picked up Harris Eisenstadt’s Guewel. It is an interesting sound with drums, bari sax, french horn, trumpet and cornet, each played by a great musician. It is definitely worth checking out. I also just posted some live mp3s of improvised duos I recorded in Chicago in October. One show was with saxophonist Dave Rempis, and the other was with fellow trombonist Jeb Bishop. They can be found here.